If you’re a fitness enthusiast looking to invest in a high-quality piece of exercise equipment for your home, then you should consider an Assault AirBike. In this review, we’ll break down the differences between the two models and answer questions about the product. Getting in an awesome cardio session at home is easier when you have access to high-quality, durable fitness equipment. The Assault AirBike is a top-rated fan bike that is an excellent option for every level of fitness enthusiast. It’s adjustable size, air resistance system, and total body training features make it effective for beginner to advanced exercisers, and it can help you lose weight, tone up, and improve your cardiovascular health. In this article, we’ll dive deep into the two fan bikes offered by Assault, and give you the specifications and details of each. We’ll discuss who the equipment is best suited for, and how it stacks up against other models on the market. Finally, we’ll give you shopping tips to save money on your purchase. What Is the Assault AirBike and How Does It Work? 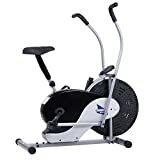 A piece of indoor exercise equipment built for home or commercial use, the Assault AirBike is an exercise bike that gives you a full-body cardiovascular workout. It utilizes a fan air resistance system that adapts to your fitness level giving you more of a challenge the harder you push and making it suitable for users at various strengths. It also incorporates upper body activity with the dual moving arm bars that follow the motion of your legs as you pedal. This fan bike model is popular with the US military and Crossfit gyms nationwide, but it’s also a trusted choice for people who want a piece of equipment for home use. It’s adjustable and can accommodate kids, adults, and seniors and comes equipped with programs, sensors, and computers that track things like heart rate, distance, time, and calories burned. Assault offers two different models of the product, the Classic and Elite. Here are the differences between the two. The original model by Assault, the Classic is constructed to be smooth and durable and includes twenty sealed ball bearings at points throughout the frame to beef up the robust construction. The computer offers pre-programmed workouts like interval training, heart rate training, Tabata, and more to help push you harder and help accomplish your fitness goals. It’s Bluetooth compatible so that you can sync it to your favorite fitness app. This option can accommodate users who weigh up to 300 pounds and uses a 25-inch steel fan to give you resistance when you pedal. Although this is the “entry level” model, it’s used in both home and commercial spaces and comes with a limited lifetime warranty that includes five years on the frame and two-years on the non-wear parts. The Elite model has all of the functionality of the Classic, with a few extra touches that make it perfect in commercial settings. It features solid steel-frame construction that’s enhanced with corrosion resistant materials like an aluminum seat post and slider. This means it will stay in top conditions for years despite repeated use. In addition to the robust materials, the Elite model has a few upgrades. The seat is built to be even more comfortable, and it’s larger than what comes on the Classic. It also has additional features in the built-in computer including a high-contrast screen and work/rest intervals. The handles are another improved feature on this model and allow for multiple grip variations so that you can find which is most comfortable for you. This model supports users who weigh up to 350 pounds and comes with a limited lifetime warranty that covers five years on your frame, three years on the non-wear parts, and one year on labor. There are several reasons why Assault AirBikes are so popular in the fitness industry, especially in high-volume Crossfit gyms. Here are just a few ways that they differentiate themselves from their competitors. Both AirBike models come with a series of programmable workouts that are particularly helpful if you’re exercising at home. They can help push you harder while delivering a solid calorie burn in a safe and effective environment. You can choose from interval options, train for time, distance, heart rate, or calories, or also use the manual setting. The easy to read and navigate screen displays your stats like speed, time, distance, watts, RPM, and heart rate to help pie stay on track. Although exercise is sometimes uncomfortable, that doesn’t mean that your position on your fitness equipment should be what causes you pain. Assault has one of the most adjustable seats on any indoor bike, which means you can make tweaks to get it in the perfect position for you. Unlike competitor models that only allow you to move it up and down, this option lets you change your position front to back, and also tilt the seat to take pressure off of sensitive spots. Even better, you don’t need any tools to make the changes. It’s all done via built-in levers. Another helpful feature of this brand of AirBike is that it’s compatible with Polar wireless chest straps. If you want to capture your heart rate data during your workout, the computer console on the bike will automatically sync to your strap and display that info. Although these bikes are perfect for home use and can accommodate novice exercisers, the company builds them to meet the needs of advanced athletes with rigorous exercise schedules. This means that they include only the highest-quality, most durable materials and can last for hundreds of thousands of miles before you ever need to do any maintenance. Although they are pricier than some of the entry-level models available, you could realize a cost savings in the long run. You’ll never have to worry about repairs or replacements unless you’re using the bike in a busy commercial setting. Both of the AirBike models are high-quality products that are built to last. That’s reflected in the cost of the equipment. The AirBike Classic retails for $$ on the Assault Fitness Website. The AirBike Elite has a $$$ price tag due to its commercial-quality construction, upgrade features, and extended warranty. Assault isn’t the only company to make air powered bikes, and there are a few comparable options worth considering depending on your needs, goals, and budget. Here are three of the top contenders. The Schwinn Airdyne Pro is the model closest in both quality and capability to the Assault options. It uses the same belt drive and wind resistance technology to deliver an effective workout to both beginner and advanced athletes. The Airdyne Pro also has a built-in computer equipped with exercise programs and features steel frame construction. The most significant difference between this model and the AirBike Elite is the warranty. Schwinn provides 10-years on the frame, two years on parts, and six-months on labor. It retails for $$$, but you can often find it on sale on partner sites like Amazon for $$ or less. A slightly more affordable option, the Xebex Air Bike doesn’t carry a well-known brand name but does boast durable construction and a high-quality product. It works the same as the Assault model, using fan technology to add resistance to your workout and giving you both upper and lower body options. The Xebex model offers four-way seat adjustments letting you move it up and down as well as forward and back. However, there are no tilt or angle options on this saddle. The display screen is comparable to the Assault options and shows data like time, watts, speed, stance, and calories, and the computer is also compatible with Polar heart rate chest straps. This option is most comparable to the Classic model by Assault and retails around the same price point for $739. If you’re searching for a budget-friendly option that is perfect for regular home use, the Body Rider Exercise Upright Fan Bike might be worth considering. Although it doesn’t feature the robust construction, steel components, and extended warranties of the higher-end models, it will still deliver an excellent workout for beginner to intermediate users. It can accommodate up to 250 pounds of weight and gives you a smooth ride thanks to the fan and belt construction. The biggest drawback to this model is the stock seat the comes with it. The material is hard and not particularly comfortable, and unfortunately, you can’t change it out for another option. It’s worth considering whether it’s worth it to spend a bit more on comfort as it’s possible you won’t use the bike if the seat hurts too badly. The AirBike products made by Assault are hands down one of the best options if you’re searching for an air-powered exercise bike and have the budget to spend on a pricer piece of home exercise equipment. Whether you opt for the Classic or want to invest in a high-end model with the Elite, you can’t go wrong with products made by this company. Not only are they both built to be virtually indestructible, but they also have a ton of additional features that make them comfortable and adaptable to people of every athletic ability. Whether you’re using it to rehab an injury or train for the Crossfit Games, it will grow and adjust with your needs and your improved conditioning. Particularly if you’re a more advanced athlete and are planning to use it daily for strenuous workouts, it will stand up to the abuse and not require any costly repairs or maintenance. 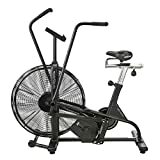 Novice exercisers who have goals of getting in shape and who want something that will not only stand up to daily use but also grow with you over time are also excellent candidates to purchase this bike. If you purchase directly from the manufacturer, you can expect to pay full price. However, you can sometimes snag savings if you shop through sites that cater to Crossfit gyms or fitness enthusiasts. For example, Rogue Fitness will often offer their email subscribers coupons ranging from ten to twenty percent off around holidays and promotions, and those can be applied towards large purchases on fitness equipment.